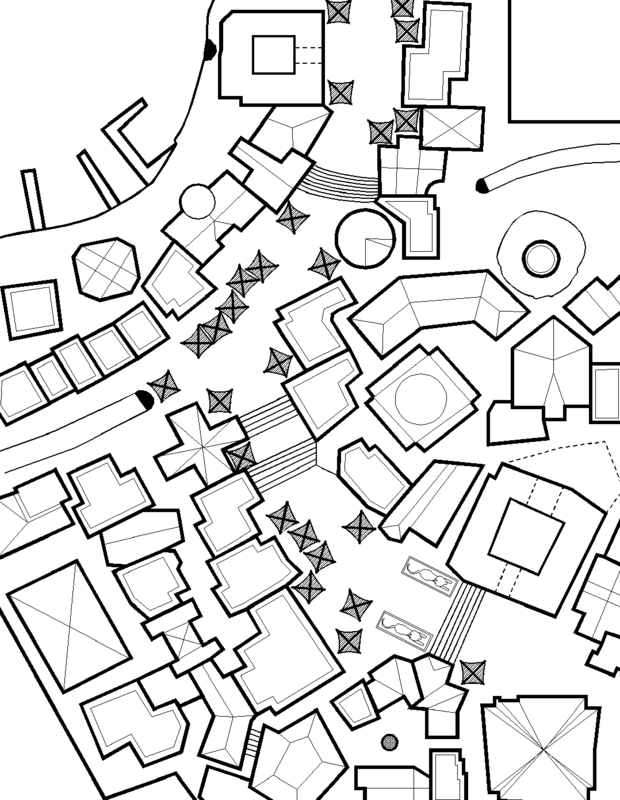 Here’s my draft map for Ibis, City of Sorcerers, showing the university area (its the collection of large buildings roughly in the center of the map). The upper right-hand corner is a corner of the Nomarch’s estate – the kind of gardens that a brash rogue from Cimmeria might stalk through on his way to liberate a tower from jewels. The lower left-hand corner is occupied by a bit of the grounds of the grand temple of Thoth, the patron deity of Ibis. The upper left-hand corner is taken up by curve in the River of Death and some quays, as well as a little cave that leads to … something. This has the kind of look I'd like to emulate – do you use any particular tools? You'll probably laugh, but I use a program called SwiftDraw that I purchased for $10 from Office Depot about 15 years ago – when I got my first PC. It still functions, and its simple enough that I can wrap my head around it without too much difficulty. For this map, I sketched things out on a piece of paper, scanned it and then brought it into SwiftDraw to play with.